Being steeped in history as the capital of the kingdom of Prussia well back in the 12th century, of the German empire in the 19th century, and as ground zero for the Cold War through much of the latter half of the 20th century, Berlin is one of the more fascinating cities that you will visit in Europe. One thing that backpackers will find particularly attractive about this place is how easy finding affordable accommodation options in Berlin really is. Standing apart from the rest of Western Europe with its low price points, it truly is a place where the budget traveler can dig in for a while, save money, see some of Germany’s best sights and have some of its best experiences. With that in mind, here are three essential attractions in Berlin that will make your visit to Germany’s capital a worthwhile one. After the conclusion of the Second World War, the remains of Nazi Germany were split between the Allied powers that stormed in from the west, and the Soviets that came in from the east. The capital Berlin was partitioned between the two solitudes, beginning a lengthy seclusion of the east side of the city from the west. The Berlin Wall Memorial preserves a 1.4 kilometre section of wall to remind visitors of the barrier that once separated families and friends, that forced a people to remain within a political system against their will, and shot and killed anyone attempting to flee. With portions of the park alternating between the staid concrete that walled off a major world city for 25 years and a stylish series of poles that mark where it once divided people, it is a sight that needs to be seen by all that visit Berlin. While the current cathedral standing here has only been around for little more than a hundred years, the Berliner Dom has existed in various forms since the 15th century. 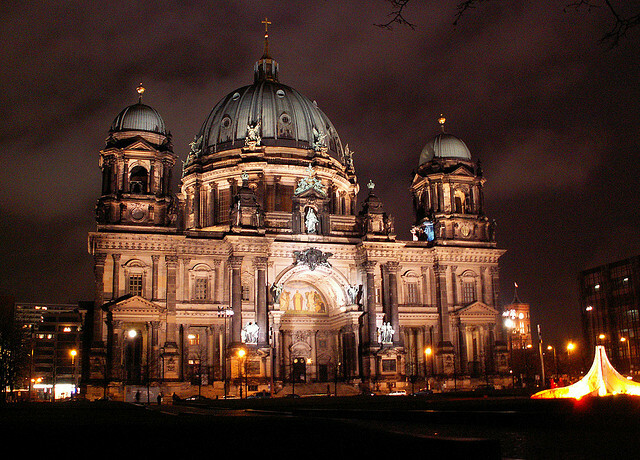 Surviving the Second World War mostly intact, repairs took the better part of fifty years to complete, but today, this spectacular Christian church is the biggest of its kind in Berlin, and it offers a spectacular view of the surrounding city from its dome. After all the sightseeing that you will be partaking in, at some point you will be looking to kick back and relax. When the time comes for you to do this, be sure to spend a sunny afternoon at Tempelhofer Park. Constructed on the grounds of what was used to be an airport near the city centre, Tempelhofer offers everything from mini golf courses to bike trails. There is plenty of room for a picnic lunch here, so visit a market beforehand and pick up some fresh food to nosh on while you soak in a perfect day outside with the locals!